The post-Christmas heatwave has begun. Canberra had 37oC earlier today and Victoria and South Australia have both had temperatures above 40oC for several days. Miss Five was wandering around the house with only a small, strategically placed notebook to cover her nakedness when Auntie T. jokingly suggested that she should get a fig leaf from the garden. Miss Five looked puzzled. “Don’t you know the story of Adam and Eve?” asked Aunty T.
Aunty T. being a palaeontologist, looked quite pleased too, especially as she had taken the girls to a science museum the day before. The illusion was quickly shattered however, as Miss. 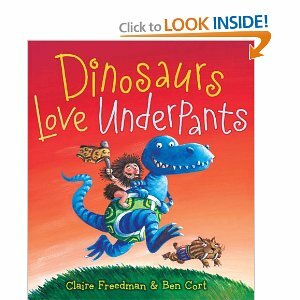 Five went on to explain about a book she has at home where the dinosaurs wear fig leaves to get with the fashion trend set by humans. A long way back in history. No one knows quite how or why. I guess there are fairy stories and fairy stories, but at least she does know that dinosaurs lived on the earth a long, long time ago.